Villa Beach has a fantastic view of the canal it sits on. Western exposure with sun almost the entire day as well as a view of the sunsets during the evening. It lies just three minutes from the Caloosahatchee River with direct access to the Gulf of Mexico. Electric, poolheat, Cable TV / Wi-Fi is included in the rent. The pool patio is fitted with a sofa as well as 4 sun lounges. There is a table that seats six people under the patio roof with a propane grill. There is a reserve tank propane in the garage. The pool allows for endless fun and relaxation with a great view of the garden. Villa Beach has three bedrooms which allows for enough room for the entire family. The kitchen is well equipped with an ice maker in the refrigerator and microwave. Washer and dryer is also available. in the garage is 2 bikes for the guests to enjoy. The only traffic is the residential traffic on the street. No through traffic. Florida Villa Beach in the attractive " Yacht Club " area of Cape Coral with 5 minutes to the nearest sandy beach Yacht Club Beach with fishing pier and Tiki-restaurant Boat Huuse with live music. 5 min to the closest beach - Yacht Club Beach. 25 mins from Southwest International Airport (RSW) outside Fort Myers. Security deposit: Paid at at arrival, repaid at departure. MyFlorida.se has Susanne Perstad as a contact person in Cape Coral, Florida who will help you with all your questions. Luxury Villa Bella Vista has a fantastic view of the canal it sits on. Western exposure with sun almost the entire day as well as a view of the sunsets during the evening. 20 min by boat to Caloosahatchee River with direct access to the Gulf of Mexico. The pool patio is fitted with a sofa as well as 2 sun lounges. There is a table that seats six people and a summer kitchen with everything you could wish for. There is a reserve tank propane in the garage. The pool with Jacuzzi allows for endless fun and relaxation with a great view of the garden. Villa Bella Vista has three bedrooms with four baths which allows for enough room for the entire family. There is one master bedroom with a king size bed, 2nd guest room with a king bed and 3rd guestroom. All bedrooms has their own bath. 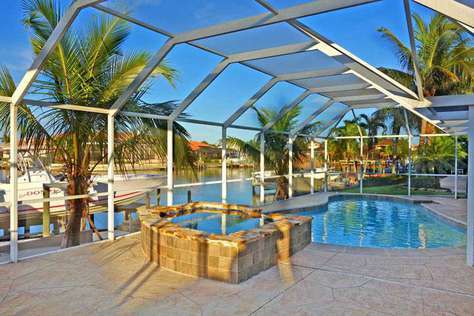 Florida Villa Bella Vista in the attractive " Yacht Club " area of Cape Coral with 5 minutes to the nearest sandy beach Yacht Club Beach with fishing pier and Tiki-restaurant Boat House with live music. MyFlorida.se has Susanne Perstad as a contact person on site in Cape Coral, Florida who will help you with all your questions. Villa Bimini has brand new fresh decor. The pool area with a beautiful view of the canal. No transit traffic. Only traffic accommodation in the area. The villa has a total of eight beds. Two of the bedrooms have double queen beds. The master bedroom has sliding glass doors leading directly out to the pool area. Bedrooms 3 and 4 have two single beds in each room. Further, there are two bathrooms one with shower and one with bath. The kitchen is well equipped with ice maker and microwave. Washer / dryer available. YouTube and Netflix TV, Internet with Free Wi-Fi. Four bikes in the garage for the guests to enjoy. Extra large swimming pool with a large pool area. Electric heated pool. On the ample patio is also a gas grill with an extra tank of propane in the storage room. 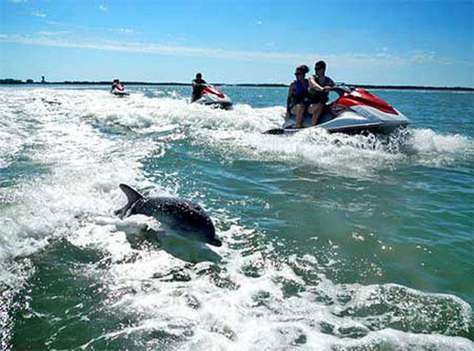 25 min both to Fort Myers Beach and Sanibel Island offers miles of beaches and a turquoise sea - the Gulf of Mexico. 30 mins from Southwest International Airport (RSW) outside of Fort Myers. If you rent a boat you can directly pass into the Gulf of Mexico, without crossing any bridges. 25 mins from Southwest International Airport outside of Fort Myers. MyFlorida.se has a contact person Realtor Susanne Perstad in Cape Coral, Florida who will help you with all your questions. Villa Casaba ligger på en stor hörntomt vid en extra bred kanal med utsikt över korsande kanaler. Det väl tilltagna poolområdet i västerläge dvs med sol hela dagen samt mot de vackra solnedgångarna har även en utebar med utsikt över kanalen. Florida villan Casaba ligger i det attraktiva ” Eight Lakes” området i Cape Coral med 10 min till närmaste sandstrand med fiskepir och Tiki- restaurang. Stor privat brygga med plats för solstolar, här har du stor chans att se vilda delfiner simma förbi. 5 min med båt till floden Caloosahatchee med direkt access till Mexikanska golfen. Floridavillan har 4 (5) luxuösa sovrum som erbjuder tillräckligt med plats för hela familjen och /eller vänner totalt 8 sängplatser + 2 extra sovplatser i en bäddsoffa. 2 mastersvitar: 1 master svit på bottenvåningen har skjutbara glasdörrar som leder direkt ut till poolområdet + 1 master svit på 2:a vån med egen balkong med utsikt över kanalen. Tre av sovrummen har dubbelsängar. 1 sovrum med 2 st enkelsängar samt ett sovrum med bäddsoffa som bäddas upp till en dubbelsäng. Köket är välutrustat med ismaskin och micro. Tvättmaskin/tumlare finns. Villa Casaba har en ny fräsch inredning. Enbart genomfarts trafik från boende i området. Kabel-TV med över 100 kanaler, Internet/WiFi med bredbandsuppkoppling. 10 min till närmaste sandstrand / fiskepir / Tiki-restaurang. 30 min både till Fort Myers Beach och Sanibel Island som erbjuder milsvida stränder och ett turkost hav - Mexikanska golfen. 30 min till Southwest International Airport (RSW) som ligger utanför Fort Myers. som återbetalas vid avresa om huset är lämnat i god standard. MyFlorida.se har svensk kontaktperson Mäklare Susanne Perstad på plats i Cape Coral, Florida som tar hand om alla frågor på plats. The deposit is 20% at the time of reservation. 80% to be paid in full 90 days before arrival. Cancellation more than 90 of arrival - all money back. Between 90 - 60 days - the deposit is forfeited. Cancellation 60 days or less - all money forfeited. Charming Villa Coral Breeze 100 yards from Caloosahatchee River for the small family - Florida Villa with private pool and patio. Less than 5 min to closest beach - Yacht Club Beach with Tiki -Restaurant and Fishing Pier. 3 bedrooms with two bathrooms, all bedrooms with queen-size beds. There is also an extra room available if you get company. When you enter the Villa Coral Breeze you see the bright and light living room with views over pool area. Dining table under roof with a large private patio. Villa Coral is located in a quiet, attractive and family friendly neighborhood in south Cape Coral Yacht Club area - 100 yards from the Caloosahatchee River . Close to shopping and restaurants. Roofed patio with a view of the generous pool area. In the pool room - under the roof - is a dining table with seating for 6 guests. Florida Villa Coral Breeze in the attractive " Yacht Club " area of Cape Coral with 5 minutes to the nearest sandy beach Yacht Club Beach with fishing pier and Tiki-restaurant Boat Huuse with live music. Luxury Villa Dolphin has 3 bedrooms offering enough space for the whole family. 1 master bedroom with king size double bed with sliding doors to the pool area, guest bedroom one with a king bed with sliding doors to the pool area, guest bedroom 2 with 2 single beds. The kitchen is well equipped with ice maker and microwave. separte laundry room with washer / dryer. Only pass through traffic from residents in the area. Extra large pool area with lots of space for sun loungers . From the vacation rental Villa Dolphin it takes only 10 minutes to the nearest sandy beach - Yacht Club Beach with fishing pier and Tiki-restaurant with live music. 10 min to the closest beach - Yacht Club Beach. Security deposit: Repaid at departure. MyFlorida.se has a contact person Realtor Susanne Perstad in Cape Coral, who will help you with all your questions. OBS: This property is being updated with a new kitchen, tile floor and new paint inside. new pictures will be posted when the house is doen Jan 15, 2019. Villa Dolphin View has an open floor plan. 4 bedrooms with Queen size double beds and 3 bathrooms. Master suite has sliding glass doors leading directly out to the pool area. The pool area facing south, with sun all day.m There are two seating areas, one of with a sofa / table on the front of the house and one that seats 8 guests on the patio under roof by the pool towards Caloosahatchee river. You also have sun lounges under the gazebo towards the river. At this house you will most likely see wild Dolphins swim by. 1 minutes boat ride to the Caloosahatchee River with direct access to the Gulf of Mexico. No pass through traffic. Dolphin View is at the end of a cul-de-sac. 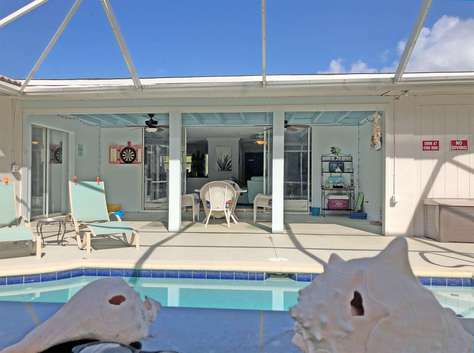 Florida Villa Dolphin View is located in the attractive Yacht Club area of Cape Coral with 5 minutes to the nearest sandy beach Cape Coral Yacht Club Beach with fishing pier and Tiki- restaurant Boat House. 25 mins from Southwest International Airport (RSW) outside of Fort Myers. Security Deposit: Refundable at departure. MyFlorida.se has Realtor Susanne Perstad as a contact person in Cape Coral, who will help you with all your questions. Vacation rental Villa Flamingoo has an modern open floor plan and is located on the canal with pool area facing west. Sun all day on the patio and towards the well-known Florida sunsets with views of the canal. size bed and the 3rd bedroom with two twin bed. Both guest bedrooms share a bathroom. The kitchen is well equipped with ice maker and microwave. Washer / dryer available. Villa Flamingo has only pass through traffic from residents on the street. The living room has a has a big flat screen TV and huge folding sliding doors towards the lanai and a wonderful view over the pool area and canals. 25 min to Sanibel Island and Fort Myers Beach. 30 mins from Southwest International Airport ( RSW )outside of Fort Myers. Security deposit: Refundable deposit by departure. MyFlorida.se has a contact person in Cape Coral Susanne Perstad, Florida who will help you with all your questions. The luxury Pool Villa Hatchee is situated at an extra wide canal with views of intersecting canals. Pool area in the north / west position with sun all day and towards the beautiful sunsets. From the pool area you have a beautiful view of the extra wide canal. Florida villa Hatchee has 4 bedrooms. 2 mastersuite: both have sliding glass doors leading directly out to the pool area + 1 master with en suite bath. Three of the four bedrooms have double beds. 1 bedroom with king size bed, 2 bedroom with queen-size double beds. 1 bedroom with 2 single beds. The kitchen is well equipped with ice maker and microwave . Only passthrough traffic from residents in the area . 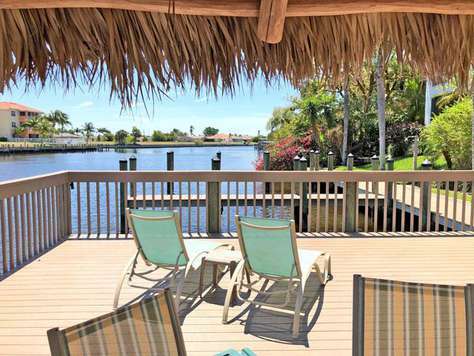 Florida Villa Hatchee is located in the attractive " Yacht Club " area of Cape Coral with 5 minutes to the nearest sandy beach Yacht Club Beach with fishing pier and Tiki-restaurant Boat House with live music. 25 min from Southwest International Airport (RSW) outside of Fort Myers. The Pool Villa Maxim has 3 bedrooms. Master bedroom with king size double bed with private bath, bedroom 2, with 2 single beds. Bedroom 3 - Queen bed. Both guestbedroom share a bathroom which is also a poolbath. The kitchen is well equipped with ice maker and microwave. Villa Maxim has recliner sofas and also as a bonus playable piano for those who wish. Extra large pool area with Jacuzzi. Two seating groups on the lanai one of them under roof. There is also a propane BBQ. Electric, Cable TV / Wi-Fi is included in the rent. Separate laundry room i the house with washer and dryer. From the vacation rental Villa Maxim it only takes only 10 minutes to the nearest sandy beach Yacht Club Beach with fishing pier and Tiki-restaurant Boat House with live music. Villa Mistral on a large corner lot has 3 bedrooms - 2 bedrooms. The living room has a has a big flat screen TV and huge folding sliding doors towards the lanai and a wonderful view over the pool area and intersecting canals. The kitchen is well equipped with ice maker and microwave. Washer / dryer available. Villa Mistral is located at the end of a cul-de-sac, only pass through traffic from residents in the area. Extra large pool area with Hot Tub and 2 seating areas both under roof, one of them is a corner sofa. Villa Mistral has 2 docks: One corner dock with a great view towards the main channel Bimini and over intersecting canals. On the corner dock is a permanent seating area and a separate dock with boat lift. From the vacation rental Villa Mistral it only takes only 10 minutes to the nearest sandy beach Yacht Club Beach with fishing pier and Tiki-restaurant Boat House with live music. 30 min to Sanibel Island and Fort Myers Beach. 35 mins from Southwest International Airport outside of Fort Myers. MyFlorida.se has a contact person in Cape Coral Realtor Susanne Perstad, who will help you with all your questions. 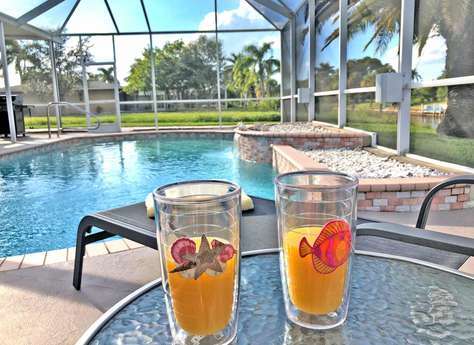 The Cape Coral vacation rental Villa Palaco Grande has 3 bedrooms - master bedroom with a King size bed with private bath, 2nd bedroom with a queen size bed and the 3rd bedroom with one twin bed and a bunk bed. Both guest bedrooms share a bathroom . The living room has a has a big flatscreen TV and huge folding slidingdoors towards the lanai and a wonderful view over the pooolarea and canals. Extra large pool area with Hot Tub and 2 seating areas one with sofa and 2 chairs. Lots of space for the whole family. Villa Mistral is located at the end of a cul-de -sac, only pass through traffic from residents in the area. From Villa Palaco Grande it only takes only 10 minutes to the nearest sandy beach Yacht Club Beach with fishing pier and Tiki-restaurant Boat House with live music. Villa Palaco Grande has a big dock with space for fishing and sun lounges. Please observe it has been a cat and a dog in the house. Newly decorated Villa Pelican has 2 bedrooms and 2 baths. Master bedrooom with a kingsize bed and private bath with a shower and sliding glass doors leading directly out to the pool area. 2nd bedroom has two twinbeds and has it´s own full bath. There is tile in the whole house. The kitchen is fully equipped with icemaker and microwave. Washer and dryer included in a separet laundry room in the house. The outside dining area - under roof - is a BBQ and an additional large dining table with seating for 6 persons. The specially designed pool provides relaxation and a deck overlooking the canal. The pool area is located in the sought after west location with sun all day and towards wonderful sunsets. Or why not sink into a refreshing hot tub after a day on the beach . Child safety fence for the pool available if desired. Villa Pelican is located only 10 minutes by car to the nearest beach, Yacht Club Beach with Tiki-Restaurant Boat House and Fishing Pier. Boatlift is available for the guests to use for their boatrental. Pool and Hot Tub is solar heated. The fully-renovated pool villa is located in the attractive Yacht Club area of Cape Coral with 5 minutes to the nearest sandy beach Yacht CLub Beach with fishing pier and Tiki restaurant Boat House. Master bedroom with an suite bathroom and a king size bed, 2nd bedroom with two twin beds and private bath, the third bedroom has a queen bed and it´s own bath also with granite. Kitchen with granite countertops and stainless appliances among other things. Ice machine and microwave. Separate laundry room with washer and dryer in the house. In the pool room - under the roof - is a dining table with seating for eight. As well as a cozy corner with a corner sofa with a table . The pool offers relaxation and play with unobstructed views of the garden and the canal. On the patio there is a gasgrill with a spare tank in the store. Large wooden dock where you can enjoy the wonderful sunsets . Large tropical mature garden designed for outdoor games . MyFlorida.se has Realtor Susanne Perstad as a contact person in Cape Coral, Florida who will help you with all your questions. The pool villa Saga has walking distance to shopping and restaurants. It is only a 3-minute drive to the nearest sandy beach Yacht Club Beach with fishing pier and Tiki-restaurant Boat House. Villa Saga has 3 bedrooms and tile throughout the house. 1 master suite with a kingsize bed and a bath with sliding glass doors leading directly out to the lanai. Bedroom #2 and #3 has Queen beds. The two guest bedrooms share a bathroom. The pool area has two seating areas, one table that seats six guests. There is also a couch and a chair. There is a lot of space for the sun loungers. 5-7 minutes by boat to the Caloosahatchee River with direct access to the Gulf of Mexico. 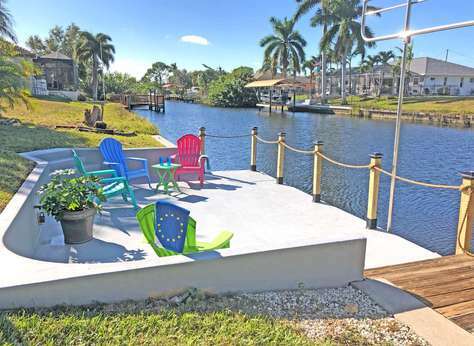 Florida Villa Saga in the attractive " Yacht Club " area of Cape Coral with 5 minutes to the nearest sandy beach Yacht Club Beach with fishing pier and Tiki-restaurant Boat House with live music. Florida Villa Santa Rosa has 3 luxurious bedrooms offering enough space for the whole family and / or friends a total of 6 beds. Master suite has a king size bed, sliding glass doors that lead directly out to the pool area and a private bath. Guestroom 2 has a king size bed, guestroom 3 has a queen size bed. All bedrooms have their own bathrooms with granite. The kitchen is well equipped with ice maker and microwave. Separate laundry room in the house with washer and dryer available. The generous pool area facing west and the beautiful sunsets has everything you could want: Hot Tub, Wet bar, Pool bar, Sun shelf with fountain. Besides a large roofed patio with a table seating 8 is also a BBQ and an extra tank of propane in garage. Dock with Tiki umbrella with space for sun loungers. 25 min to Fort Myers Beach and Sanibel Island. Villa Savona has 3 bedrooms and 2 baths. 1 master suite with a kingsize bed and a bath, sliding glass doors leading directly out to the lanai. Bedroom 2 have a Queensize bed and bedroom 3 with 2 single beds. The two bedrooms share a bathroom which is also a poolbath. The kitchen is well equipped with ice maker and microwave and granite counter tops. Stainless steel appliances. Besides a large roofed patio with a table seating 6 is also a BBQ and an extra tank of propane in garage. Large pool area facing east with morningsun into late afternoon. The pool area is large enough for sun loungers, 5 minutes by boat to the Caloosahatchee River with direct access to the Gulf of Mexico. Nice paved dock with views of the canal. Separate laundry i the house with washer and dryer. The pool Villa Savona is located less than 5 minutes from shopping and restaurants. It is only a 10 minutes drive to the nearest sandy beach - Yacht Club Beach with fishing pier and Tiki- restaurang Boat House. 30 min to Fort Myers Beach and Sanibel Island. Villa Saxony has three bedrooms and 2 baths. Master bedroom with private bath has sliding glass doors leading directly out to the pool area. Bedroom 2 also has sliding doors directly to the pool area and share a bath together with the 3rd bedroom. In the villa there are also two huge flat-screen TVs. The kitchen is fully equipped with granite countertops, ice maker and microwave. Separate laundry with washer and dryer. In the pool room - under roof - includes dining table that seats six people and a propane BBQ. There is also a Tiki-bar and a couch under roof. The swimming pool features relaxation as well as the deck overlooking the canal. Villa Saxony is just 5 minutes from the nearest sandy beach the Yacht Club Beach with a fishing pier and Tiki- restaurant Boat House. There are tennis courts and a playground for kids. The Yacht Club Beach is handicap accessible. Villa Saxony is located on a dead-end street. No obstructing traffics. 30 mins from Southwest International Airport outside of Fort Myers. Villa Seaside has 3 bedrooms and 2 baths. Master bedroom with private bath with sliding door towards the pool area, one guestroom with sliding doors to the pool area, one guest rooms has 1 king size bed and one queen size bed and both share one bathroom. The kitchen has granite counter tops and stainless-steel appliances. Well equipped with ice maker and microwave. Separate laundry room with washer and dryer in the house. Livingroom overviewing the Mohave lake. Lanai under roof with dining table that seats 6 guests. BBQ - with an extra tank propane in the garage. Big dock with lots of space for sun lounges. Only 10-12 min to closest beach - Yacht Club Beach with Tiki -Restaurant Boat House and Fishing Pier. 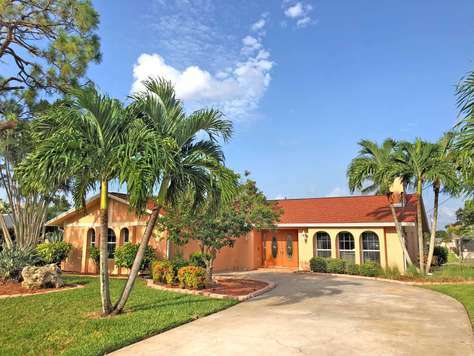 Spacious pool villa with an open plan of located in a quiet attractive and child-friendly area in the east of Cape Coral close to shopping and restaurants. The street is only trafficked by the neighbors, no disturbing through traffic. Villa stingray has 3 bedrooms and 3 baths. Master bedroom with a king size bed and sliding glass doors to the pool area and private bathroom, 2nd master bedroom also has a king size bed and 2nd master has also a private bathroom, third bedroom has 2 twin beds. Central to the house is the living room with generous glass doors leading out to the pool area. With three different batches of sliding doors out to the pool area Villa StingRay is a very bright and light pool villa. Summer kitchen with BBQ on the lanai. Roofed patio with a view of the generous pool area and the beautiful sunsets. In the pool room - under the roof - is a large dining table with seating for 6 persons. The designed pool has 2 sun lounges on either side of the pool - a total of 4 pieces. The pool area is located in the sought-after west location with sun all day and towards the wonderful sunsets. Only 7 min to closest beach - Yacht Club Beach with Tiki -Restaurant and Fishing Pier. Villa SunBeam has an atmosphere that makes you quickly feel at home with an open and bright floor plan. The master bedroom has sliding glass doors to the pool area and private bathroom. Two guest bedrooms both with sliding glass doors to the pool area - both with queen double beds share toilet and bath. The kitchen with granite counter tops is well equipped with ice maker, microwave. Washer and dryer are in the house. One living room by the kitchen and dining room with generous glass doors that lead out to the pool area. Separate TV-room also with sliding glass doors to the pool area with a Tiki-bar. The lanai partly under roof is a gas grill and another large dining table with seating for six people. The custom designed pool offers relaxation and fun with unobstructed views of the garden. The lanai overlooking the generous pool area and the beautiful sunsets. The pool area is located in the sought after west location with sun all day and with wonderful sunsets. The street is solely used by the residents of the neighborhood so traffic disturbances should be a minimum. Tropical mature gardens designed for outdoor games. Villa Sunny has a total of 3 bedrooms and 3 bath. Open floor plan with large sliding doors leading out to the pool area. Two of the bedrooms have king size double beds. The master bedroom has sliding glass doors leading directly out to the pool area. Bedroom 2 has two single beds and also sliding doors directly to the pool area and a bath in the hallway, bedroom 3 has a king size bed and a private bath. Four bikes in the garage for the guests to enjoy. Large swimming pool with a large pool area. Electric heated pool. On the patio is also a gas grill with an extra tank of propane in the storage room. Private dock with room for sunlounges. No transit traffics. Only traffic accommodation in the area. Luxury Villa Sunset is located on a canal with its own pool, Tiki-umbrella and wooden dock. 4 bedrooms: three of them with double beds. The spacious pool villa of 190 sqm is located in a quiet area close to shopping areas and restaurants. Adjacent to the master bedroom with a queen size bed is a bathroom with a private jacuzzi. Master bedroom has sliding glass doors to the pool area. Bedroom no. 2 and 3 also have queen double beds, one of those bedrooms has sliding glass doors to the pool area. The fourth bedroom has two single beds. All three bedrooms share one bath. The kitchen is well equipped with micro and icemaker. Washer and dryer are in the house. Under roof on the lanai is dinner table seating 8 guests and a BBQ with spare tank propane in the garage. In the garage there is a canoe for the guests disposal. The canoe can easily be carried down to the dock. Why not take a trip by canoe in sunset on the canals - miles and miles. Life jackets are available. The pool area has southern exposure with sun all day and wonderful sunsets. Dock with Tiki-umbrella and great place for sun beds etc. The street is solely used by residents of the neighborhood. The pool is heated with solar panels. 15 min to the closest beach - Yacht Club Beach. 35 mins from Southwest International Airport (RSW) outside of Fort Myers. El, poolvärme och KabelTV + WiFi ingår i priset. Tllkommer endast banköverföringsavgift $15 för mottagande och avsändande bank. Säkerhetsdeposition $400 eller motsvarande i svenska / norska kronor. Electric, pool heat, Cable TV / Wi-Fi is included in the rent. Guest pays both receiving and sending banks wiring fees ($15). Security Deposit is paid in cash, $400 at arrival and repaid in cash by departure. Villa Sunshine has an open floor plan with lots of space for 8 guests. 4 bedrooms and 2 baths. Master bedroom with a king size bed and master bath. 2 guestrooms with queen beds and the 4th bedroom with 2 single beds. All three bedrooms share the 2nd bath newly renovated. The kitchen with granite counter tops is well equipped and has a microwave and icemaker. Laundry room with washer and dryer are in the garage. Villa Sunshine has 4 big glass sliding doors towards the lanai / pool deck. The pool area is located in the sought after southern location with sun all day on the lanai. Brand new BBQ on the lanai with an extra tank with propane in the garage. Only 5 min to closest beach - Yacht Club Beach with Tiki -Restaurant and Fishing Pier. Roofed patio with a view of the generous pool area and the view over the canal. In the pool room - under the roof - is a large dining table with seating for 8 guests. The big pool area has lot of space for the sun lounges. Pool is heated with solar panels. Villa Triton has an open-plan bar kitchen with granite and stainless steel appliances. Master bedroom with one king-size bed and a private bath. Bedroom no. 2 with one queen bed and bedroom nr. 3 with 2 single beds. Two of the three bedrooms have sliding glass doors directly out to the pool area. Central to the house is the living room and dining room with generous glass doors leading out to the pool area. The kitchen is well equipped with among ice maker and microwave. Washer and dryer. Patio under roof with views of the canal and pool area. Villa Triton also has a dock where you can sit by the canal and take their morning coffee. In the pool room - under - the roof is a large dining table with seating for 6 people and a sitting area. A heated Hot Tub is also a popular meeting place. The pool area has western exposure with sun all day and to the wonderful sunsets. On the patio there is a gas grill with an extra tank of gas in the garage. The street is only trafficked by the neighbors, no disturbing through traffic. 25 min to Sanibel Island - miles of white sandy beaches. Villa White Heron was totally renovated 2017. Villa White Heron has an open floor plan, kitchen with an island and stainless-steel appliances. Livingroom with 4 big sliding doors towards the pool and canal. Villa White Heron has 3 bedrooms and 2 baths. Master bedroom with a king size bed and private bath, sliding glass doors to the patio. Both guestrooms with 2 twin beds each that easily can be put together to a double bed. Both guest bedrooms share one bath. The lanai has space for sunning, swimming and dining. Dining table seats 6 people + 2 extra chairs. There is also a propane grill /BBQ with an extra propane tank in the storage. 2 sun lounges for you to enjoy. The custom designed pool gives many hours of play and entertainment. La Pistal is a very spacious corner condo with high ceilings -1070 sq ft - is located in one of the nicest areas in southeast Cape Coral. The condo is located only minutes away from downtown Cape Coral. Condo La Pistal has a fully equipped kitchen with everything you possible will need for your vacation. Condo La Pistal has 2 bedrooms - Master bedroom has a Flat screen TV, 1 king size bed and sliding doors that opens to the lanai area, walk in closet, walk-in shower and toilet. Bedroom 2 also has a1 king size bed, bathroom in the hallway with a full bath. The outside dining table on the balcony is under roof and has a beautiful view of the canal. Within minutes you will be able to shop/eat at great restaurants and for the fisherman in your party, there is big dock by the canal with a large Tiki-Hut. There are plenty of Boat rentals nearby. No drive through traffic - only from the neighbors living on the street. Walking friendly neighborhood. Only 7 min to the closest beach - with fishing pier, Tiki-Hut restaurant, playground, tennis and racket ball. El, KabelTV + WiFi ingår i priset. Condo Rubicon is a very spacious corner condo with high ceilings -1070 sq ft - is located in one of the nicest areas in southeast Cape Coral. The condo is located only minutes away from downtown Cape Coral. Condo Rubicon has a fully equipped kitchen with everything you possible will need for your vacation. Condo Rubicon has 2 bedrooms -Master bedroom with 1 king size bed and sliding doors that opens to the lanai area, a walk-in closet, walk-in shower and toilet. Bedroom 2 also has a1 King size bed, bathroom in the hallway with a full bath. The outside dining table on the lanai is under roof and has a beautiful view of the canal. Pool heated with solar panels. Master bedroom have a King size bed and two twin beds in 2nd bedroom. Washer/Dryer in unit. Fully equipped Kitchen. The spacious balcony has table and 4 chairs. A 10 minute drive north to the top of the island is the fishing pier and lots of fun activities. There is the convenient Ft Meyers’ Beach Trolley to get you to all the popular locations without having to drive your car, its $0.50 for an adult, leaves every 45 minutes, you can take your bikes and other items on the trolley, is an easy, fun, and inexpensive way to get around on Fort Myers Beach, Fl. In this community you can play tennis, choose between 2 pools, parking under the condo. Walking distance to restaurants and shopping. Walk to the beach - Fort Myers Beach. 20 min from Southwest International Airport outside of Fort Myers. Condo Blue Heaven has a fantastic view of the canal it sits on. Southern exposure with sun almost the entire day. allows for endless fun and relaxation with a great view of the canal. Condo Blue Heaven has two bedrooms both with queen double beds. Master bedroom with master bath en suite. The kitchen is well equipped with an ice maker in the refrigerator and microwave. Washer and dryer is also in the condo. Condo Blue Heaven in the attractive " Yacht Club " area of Cape Coral with 5 minutes to the nearest sandy beach Yacht Club Beach with fishing pier and Tiki-restaurant Boat Huuse with live music. 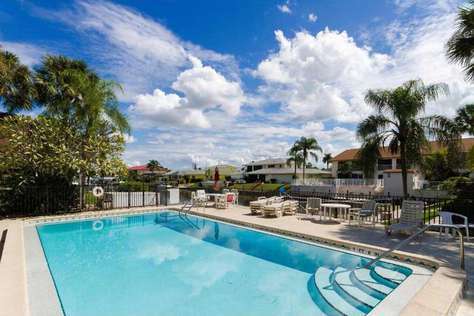 Condo Get Away This spacious condo -1110 sq ft - is located in one of the nicest areas in southeast Cape Coral. The condo is located only minutes away from downtown Cape Coral. Within minutes you will be able to shop/eat at great restaurants and for the fisherman in your party, there is big dock by the canal where you can dock your boat. There are plenty of Boat rentals nearby. Condo GetAway have 2 bedrooms - Master bedroom has a Flat screen TV, 1 king size bed and sliding doors that opens to the lanai area, a huge closet, and a full bath. Guestroom has 1 King size bed, bathroom in the hallway with a full bath. In this charming condo you have only a few yards to the pool area. The pool has both southern exposure with sunlight from early midmorning to beautiful sun sets. Condo GetAway has a fully equipped kitchen with everything you possible will need for your vacation. Only 7 min to the closest beach - with fishing pier, Tiki-Hut restaurant, playground, tennis and racket ball. Cable TV with over 100 channels and WiFi . 25 min to Fort Myers Beach and Sanibel Island which has miles of sandy beaches by the turquoise Gulf of Mexico. 7 min to the closest beach - Yacht Club Beach. 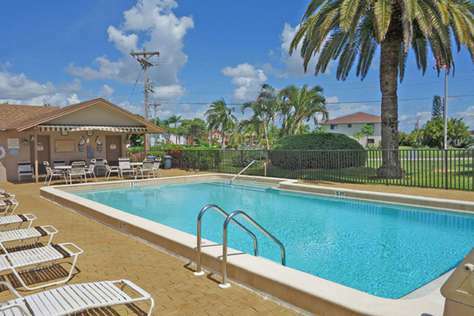 Enjoy the true sense of Florida in this 2 bedroom and 2 full bath corner unit on Country Club Blvd. Totally renovated condo, kitchen with granite counter tops and stainless steel appliances. Both bathrooms all new tile and vanities. This condo has much larger kitchen and bedrooms with the benefits of extra windows. Plus no foot traffic going by your window. This corner unit has high ceilings. Balcony towards the Gulf access canal. Dock your boat by the dock. Swimming pool area has a cabana building equipped with separate rest rooms, outside shower. Carport and separate storage for bikes etc. BBQ is included.